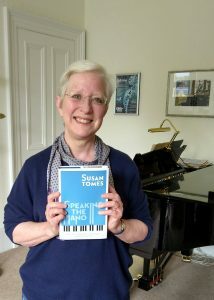 My new book ‘Speaking the Piano‘ is due out from Boydell Press in about three weeks’ time. It’s about my experiences of learning and teaching music. In essence it’s a love letter to the joys and benefits of learning an instrument to a high level. Today I received my first pre-publication copy (see photo). It was an exciting moment, because although I’ve been involved at every stage of proofreading, corrections, indexing, jacket design and so on, the book has always remained in the realm of the possible until today, when I saw that it had turned into a real book, a pleasingly solid object. It was a nice surprise too because I had only seen the jacket design on computer, which gave a slightly false idea of the colours. The actual colour was even nicer than I had anticipated, so I was very happy. Blue is my favourite colour, as I think I may have mentioned elsewhere. This entry was posted on Wednesday 23rd May 2018 at 8:18am	and is filed under Books. You can leave a response, or trackback from your own site.